Well, I’ve just returned from a day spent in Hastings where I spoke to members of the Hastings and District Geological Society on Wealden dinosaurs. I do enjoy visiting Hastings, and, despite the 4-hr train journeys I had to endure on the way there and back, Ken Brooks and Diana Williams, and Peter and Joyce Austen were very hospitable and I thank them for inviting, hosting and feeding me. Dinosaurs are often thought of as animals of far-flung places, and in particular (thanks to Tyrannosaurus and Triceratops and so on) are associated with the USA. But in fact the concept of the ‘Dinosauria’ arose in England, and all of the key early discoveries were made, by English scientists, in England. The Lower Cretaceous rocks of the mainland Wealden have, historically, been among the most important British rocks in terms of early dinosaur discoveries. The stratigraphic terminology of the Wealden is complex and rarely explained clearly: the mainland Wealden consists of the Hastings Beds Group and Weald Clay Group, and both of these units are subdivided into formations (for a good up-to-date review see Radley 2004). Several distinguished Victorian collectors are particularly associated with the Wealden, including Gideon Mantell (1790-1852), Samuel Beckles (1814-1890) and George Bax Holmes (1803-1887), and many of the fossils collected by these men are still key specimens in terms of what they tell us about the respective taxa. Some really interesting little-known tie-ins exist between Wealden dinosaurs and the world of archaeological forgery and science fiction. The 1909 acquisition of a Hastings Iguanodon specimen by the British Museum (Natural History) led to the little-known idea that William Butterfield (1872-1935), the then-curator of Hastings Museum, perpetrated the Piltdown hoax in order to make a fool of Charles Dawson (1864-1916), the discoverer of Piltdown man and extractor of the Iguanodon. Also intimated by some with the Piltdown story is Arthur Conan Doyle (1859-1930), novelist, physician, amateur detective, and ‘Crowborough kid’. Supposedly, a conspicuous number of notable parallels occur between Maple White Land of Doyle’s ‘Lost World’, and the English Wealden. Neither the cases against Butterfield nor Doyle have serious standing, and it has been easy to find gaping holes in them. As for the dinosaurs themselves, the Wealden boasts a number of particularly interesting and significant theropods – the predatory dinosaurs. In 1983, amateur palaeontologist William Walker discovered Baryonyx walkeri in the Weald Clay of Ockley, a specimen that proved to be a ‘Rosetta stone’ for the interpretation of a hitherto enigmatic theropod group, the spinosaurids. Baryonyx specimens have since been discovered in the Hastings Beds Group and in the Wessex Formation of the Isle of Wight. Allosauroids – the group that includes Allosaurus and its close relatives – are represented by several Wealden specimens, most notably the tall-spined vertebrae from Battle known as Becklespinax. From the Wessex Formation is one of Europe’s most complete theropods: Neovenator salerii, discovered in 1978. Diverse other theropods, representing the theropod group Coelurosauria, are also present in the Wessex Formation. They include the probable oviraptorosaur Thecocoelurus (represented by just half of a single neck vertebra!) and the tyrannosaur Eotyrannus, named in 2001. New data on Eotyrannus shows that it was rather more unusual than thought when described in 2001, with unique notches at the tips of its lower jaw and distinctive lower arm bones. Sauropods (the giant long-necked dinosaurs), armoured dinosaurs and others are also well represented in the rocks of the Wealden, but were not covered in my talk for reasons of time! Radley, J. 2004. Demystifying the Wealden of the Weald (Lower Cretaceous, south-east England). OUGS Journal 25 (1), 6-16. So there we go. 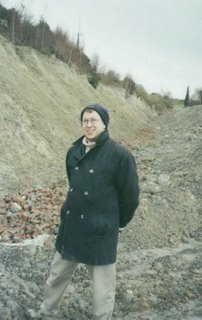 The rechargeable batteries in my camera ran out as soon as I tried to take a photo of the meeting, so the photo above instead shows me at Wealden exposures at Bexhill, taken in December 2001. Now, about those sleeping passerines…. I can't believe you skipped the sauropods for a bunch of crappy theropods. Well thanks dude. This is just the beginning. Interesting that you're a specialist in wealden theropods. I found a fossil that looks like part of a baryonyx claw eroded from the cliffs near Fairlight. Could you give an opinion on it if I sent it to you? Hi. Yes, I could give you an opinion on it. Please email me at eotyrannus at gmail dot com.